Yesterday, I received a notice of withholding from the Twitter legal team via e-mail. My understanding from the e-mail, which was written in Turkish, is that one of my tweets was banned in Turkey by a court ruling. Twitter gave me a 48-hour notice to appeal the verdict. On March 31, a Turkish prosecutor was held hostage by a far left banned Turkish group, the Revolutionary People’s Liberation Party-Front (DHKP-C). He later died from his wounds. 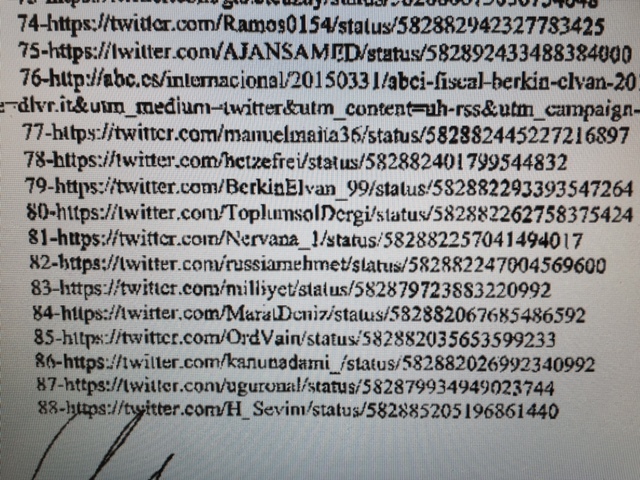 I simply tweeted the news about his kidnapping.The prosecutor was looking into the death of teenager Berkin Elvan. 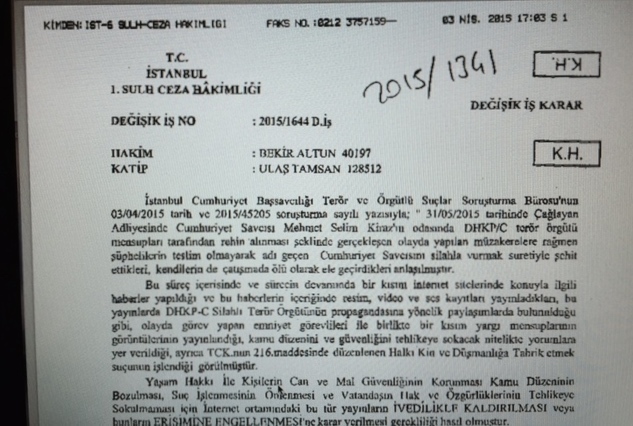 The 15-year-old died 269 days after being hit by a tear-gas canister and left in a coma following the Gezi protests in June 2013. https://twitter.com/Nervana_1/status/582882257041494017 The PDF attachment included in the e-mail has a list of 166 banned instances of content. My tweet is number 81 on this list. I do not live in Turkey, and I will not engage in a legal battle over this, however, I am deeply saddened by the whole matter. The fact that someone in Turkey wants to ban a tweet about accurate news that has happened in Turkey is frankly tragic. Mainstream Turkish newspapers such as Hurriyat have been condemned by both President Recep Tayyip Erdogan and Prime Minister Ahmet Davutoglu for merely publishing a photo that the DHKP-C militants released when they were holding the prosecutor hostage. It is worth noting that there was nothing in my tweet that endorses or supports the banned Turkish Marxist group, the Revolutionary People’s Liberation Party-Front (DHKP-C). In fact, I have never supported them or any other political group in Turkey. Moreover, on the same day, I tweeted a condemnation of their terror and stated that this is this is not the way to react to the killing of the Turkish teenager, Berkin Elvan. Some Turkish leftists criticized my comments, but I stood by my views, as I believe everyone should condemn terrorism. https://twitter.com/Nervana_1/status/582986426431700992 https://twitter.com/Nervana_1/status/582989646566555649 https://twitter.com/Nervana_1/status/583002647759736832 Interestingly, out of the 166 names included in the Turkish court list, I am the only non-Turkish individual. The rest are either Turkish national or main stream mews outlets. I do not work for any outlet or organization. This begs the question, why me? Thousands have tweeted the same photo. As an independent blogger, I comments on the entire Middle East, not just Turkey. Some Turkish troll on Twitter have written intriguing abusive messages. https://twitter.com/SultanYselim/status/584139806688600064 https://twitter.com/SultanYselim/status/584139921868378112 Regardless of the answer,I will not let anything tamper my passion and love of Turkey. I have followed Turkish politics since a very young age and I have no plan to stop now. If they stop my tweets, I will still continue blogging and writing about Turkey, a country that I simply adore. Here is a report about the incident. This entry was posted in Best Read, Middle East, Turkey and tagged AKP, Berkin Elvan, censorship, democracy, Erdogan, Freedom of expression, Mehmet Selim Kiraz, Turkey, Twitter. Bookmark the permalink. You must have done something right! As a distinguished descendent of a Sharkasseya great-grandmother mother and a bombastic Turko-Egypto landowning Bey from Banha, I can only twirl my Nisr-supporting shanabat and nervously adjust my threadbare tarboush at this latest Anatolian abomination.